Don't want to sit in a group of other people and be forced to "make confessions"? Take your class online - on your timelines. The Offender Solutions® series of 100% online classes is a nationwide service that offers a variety of adult and juvenile online classes, (See Menu of Classes below). Our classes are designed to be easy, informative, self paced, convenient and, of great importance - affordable. 100% online, no lectures and no judgments. Our goal is to provide honest and accurate information to our class participants. Offender Solutions® programs were designed by Masters level counselors and practiioners with over 30 years experience in the fields of probation and parole. When we say no lectures and no judgments, we mean it! "The meta-analysis found that, on average, students in online learning conditions performed modestly better than those receiving face-to-face instruction." The study is called Evaluation of Evidence-Based Practices in Online learning. A Meta-Analysis and Review of Online Learning Studies. Who is appropriate to refer to an Offender Solutions® class? Of course you can refer any person you would like. However, as a guideline, we suggest you think of Offender Solutions® for offenders who are "average", typical or first time offenders. As you well know, we are more likely to be successful with the less hardened, serious or chronic offenders. (Though we actually like working with the high risk and/or chronic offender.) We try to make all of our materials readable at the 5th grade level. Making a referral? This is a subject we know something about. With our experience in the field of parole and probation we know that making a referral is all too often more work than is necessary. We promise to make it easy. To the right of this screen is a buttons available so you can download our referral form. It is not necessary to use this referral form. It is intended to be a convenience to you. You can simply hand the form to the person being referred and they will have instructions on what to do and how to do it. Simply open or download the referral form, print, cut and hand it to the offender. 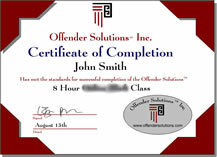 When the offender completes the class, they are issued a Completion Certificate to present to you. Feel free to contact Offender Solutions® to confirm client completion or status. Ask Offender Solutions® to send a Certificate of Completion directly to you, (mail, email or FAX). Our Certificates of Completion are extremely difficult to duplicate. For additional security, if we mal it to you, it is always embossed with our logo. David Royse and Steven Buck, in Journal of Offender Rehabilitation published "Evaluating a Diversion Program for First-Time Shoplifters". They found that 4% of the people who comple a diversion program reoffend and, equally as importantly, that 25% of the peopl who do not complete a diversion program reoffend. (v17 n1-2 p147-58 1991). Such a staggering difference is remarkable. What doesen't work? : Edward Latessa, Ph.D. Center for Criminal Justice Research says, "Most researchers who study correctional interventions have concluded without some form of human intervention or services there is unlikely to be much effect on recidivism from punishment alone." Further, "Not a single reviewer of studies of the effects of official punishment alone (custody, mandatory arrests, increased surveillance, etc.) has found consistent evidence of reduced recidivism." Using research and evidence based interventions is essential, not only to demonstrate the effectiveness of our programs but also, ethically. Our position is that we have a mission critical responsibility to provide the best, evidence based services possible. What does work? : The research community and virtually all of the relevant journals, overwhelming demonstrate the Offender Solutions® curricula which: a) uses education and, b) follows a cognitive restructuring or cognitive behavior modification model, will provide statistically significant change (results). Simply stated, Offender Solutions® maintains a fundamental belief that all clients must be treated respectfully and are seeking a better life. Our approach is to help them assess their own attitudes, values and beliefs. The research indicates that the Offender Solutions® cognitive model develops an awareness that results in an attitude change and subsequent pro-social beliefs and behaviors. The data also shows that these changes occur across male and female, juvenile and adult and among low, medium and high risk offenders. Offender Solutions®, as an agency, has a research, criminal justice and counseling psychology background. All staff are supervised by a Masters level Counseling Psychologist. We are comprised of staff and consultants from a variety of disciplines including parole, probation, psychology, social work, counseling, corrections, and a research analyst. P.S. Please read our client testimonials below or see a full list on our testimonials page. Shoplifting is not a victimless crime. It has a big impact on every business owner (large and small) and every consumer. It results in higher prices for consumers and reduced purchase power; decreased retail store profit and survivability; and through store closings, subsequent retail employee job losses. The 2009 shoplifting statistics are staggering. Nationwide, shoplifting is one of the most common criminal charges among juveniles and adults alike. The National Association for Shoplifting Prevention reports that 1 in 11 Americans shoplift, 75 percent adults, 25 percent under the age of 18. It is estimated that 615,000 shoplifting incidences occur every day in the United States. CBS News reports shoplifting to costs stores $35 million every day. CNN reports store thefts increased in 2009 for the first time in six years with over $36 billion lost. Shoplifters neglect to consider the impact they have on retailers' bottom line and subsequent increased costs for everyone at the register. To help pay for losses, enhanced security with surveillance and loss prevention personnel, shoppers can expect these increased security costs to be passed on in price increases as theft rates (and costs) continue to rise. National statistics show shoplifting rates escalating during the holiday season and into the New Year, a critical time when retailers normally expect to account for up to 50 percent of their total annual sales. I cannot thank you enough for your prompt responses and attention to this matter. You have been exceptional in your support and I appreciate your professionalism. I have a comment I would like to share. I have just completed your course and I would like to tell you how much I learned from this course. I am a 54 yr old professional that made a error in judgement in a Worker's Comp case. I had the attitude as you described in the course of "its not hurting anyone"....Your lessons brought me back into my childhood and made me remember how many people "I hurt" ..For this I thank you and you have changed my life. "I DO CARE"
I just completed my course, I guess I just want to go over what I did learn and what I'm still struggling with. I would be lying if I said I didnt learn anything, and I would also be lying if I said it wasn't still hard for me to have thoughts of stealing. I suppose it will take time and practice at becoming a normal human again before these thoughts go away. I have not stolen since taking your class and I honestly have changed my thinking about it. What I didnt expect from this course was that it would bring back values I used to believe in. A reminder of who I truly am inside. That feels really good and I do want to thank you guys. I do feel like I could use some support to continue to make good choices. By the way, I really found the information to be eye-opening. Like so much of it was dead on exactly I used to think of things BEFORE I understood the reasoning behind why we think the way we do and what effects it has on us. My biggest take-away was that in order to "stop" from stealing I need to stop the mental rehearsing. I never noticed how much I really did do "mental rehearsing" until I read that chapter. Once I thought about it, I realized I mentally rehearse on a daily basis. That's the biggest thing I am going to do to ensure I never get in the situation or hurt anyone else ever again. So anyway, just wanted to say that before I took the class I didn't think I needed it...now that I took it I am very thankful I had an open-mind while reading it because I learned a lot about myself. I am confident the tools I learned really will help me in the future. I think your job is truly amazing and inspiring - pls continue your great work. I will certainly take your advice in the future. If there is any day that you are discouraged or have a difficult case to counsel, take a deep breath and realize that there is a person in Singapore, many miles away who think you are doing a good job and your efforts are indeed worth it! It's kind of strange that I will not be receiving emails from you any more as this have become my weekly routine! All the best to you and family"
Hello.Wow, I just figured out my bad choices in people and why I am here. Your class made me have many different feeling's overcome me. Make's no difference this class was amazing for so many reasons. It has opened my eyes to so much and I will come back if I have question's. So obvious the hard work, time thought etc. put into this class. Myself being A.D.D with no medication last couple years had a lot of frustration, but knowing I had to go back till I got it right in my head has been so worth it! Thank You To All Of You or You that put so much effort and care into this class. I hope to keep as much as I am capable of in my memory bank. Lord knows I have enough note's to go back on.